As you can imagine, embroidery works a little differently to printing. Embroidery machines need to be told where, when and how to place the stitches required to create your design, and this information can't be coded into a standard image file, like a PNG or JPG. For that we need something a little more specialised: we need to digitise your design file. But before we digitise your artwork, there are some guidelines that need to be followed to make sure your design is suitable for embroidery. 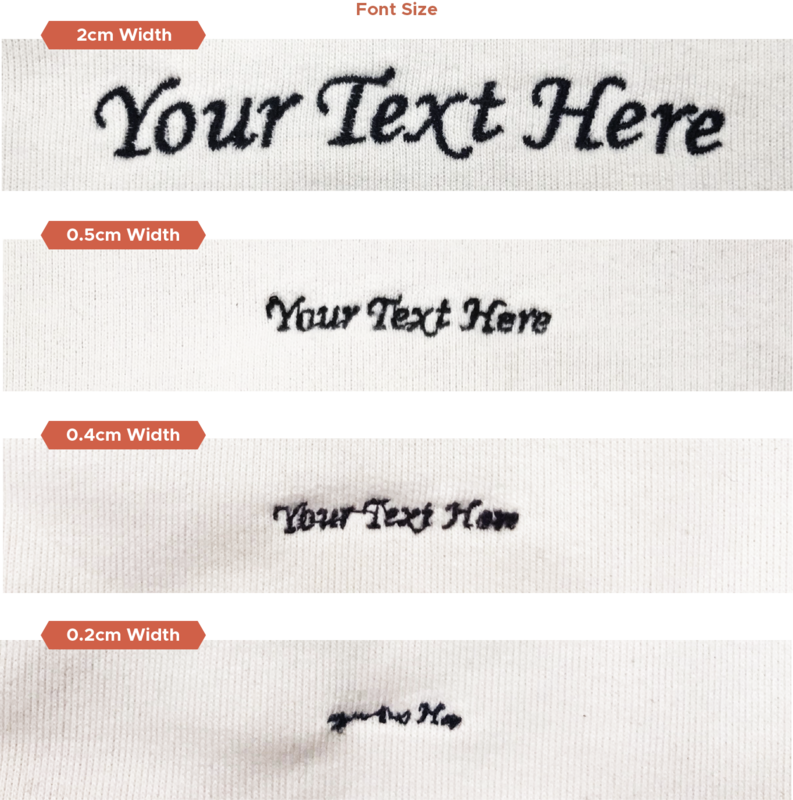 These guidelines apply to every product we embroider. Embroidery is great. It's durable, vibrant, and looks fantastic. But it has some limitations imposed by the production method, which means your design file will need to meet certain criteria to be suitable for digitising. Beanies: 11 x 4 cm rectangle. Caps: 10 x 5 cm rectangle. Clothing: 10 x 10 cm circle. Your design can be any shape as long as it fits within the boundary of the product you're having embroidered. Embroidery can only be so detailed before the finer details are lost. With this in mind we recommend an absolute minimum width of 0.5 cm for flat embroidery. For flat embroidery you can use a maximum of 4 colours. The colours used can be changed, even after your design has been digitised. This is because the digitised file does not determine the colour of thread used, that's decided when it comes to fulfilling your order. Please be aware that it's unlikely the thread colours used will match your design exactly. Whilst we make every effort to match colours as closely as possible, threads are dyed before they can be used for embroidery. When setting up your artwork we advise against using negative space. For the best result we suggest filling in any negative space in your design with a solid colour. 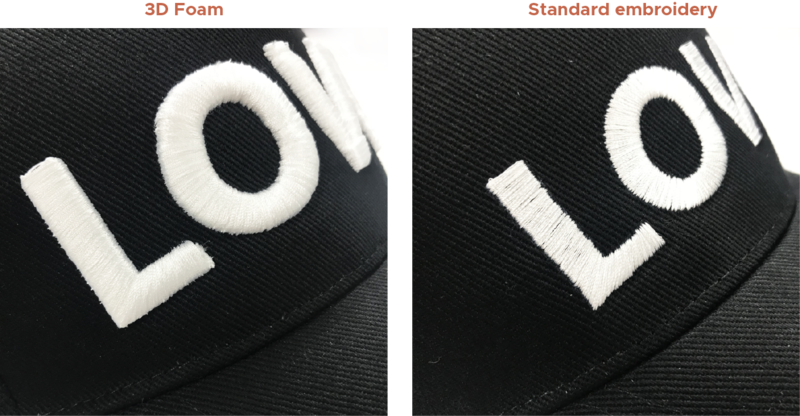 For example if we are embroidering the above design on a white cap by filling in the text white we get the same effect, but get a much neater result. 3D embroidery can really make your design pop, but there are restrictions with what is possible. There are a few best practices to follow to get the most out of this process. 3D embroidery is currently only available on caps. The print area is the same as flat embroidery at 12 x 5cm rectangle. 3D embroidery needs a wider design area to ensure the foam within the design can be tightly sealed underneath the thread, otherwise more of the foam will be visible underneath the thread. The simpler and wider the design the better the result, and we recommend an absolute minimum width of 0.75 cm. The design below is at exactly 0.75cm where you can start to see some of the foam start to poke through the thread. You can use a maximum of 2 colours with 3D foam. Please be aware that it's very unlikely the thread colours used will match your design exactly. Whilst we make every effort to match colours as closely as possible, threads are dyed before they can be used for embroidery. We also recommend choosing white or black or very light or very dark colours; the foam we use is either black or white, so foam may me visible through thread colours that contrast more. When setting up your artwork we advise against using negative space. For the best result we suggest filling in any negative space in your design with a solid colour. For example if we are printing the above design on a white cap by filling in the text white we get the same effect but get a much neater result. We recommend using either back, white, very dark or very light colours in your design as we use either white or black foam to fill the embroidery. When using different colours you can sometimes see the foam through the threads, so by keeping to very dark or very light colours from our selection above you can reduce the possibility of this as much as possible. Can I use the same digitised file across products? The short answer is yes. The longer answer is that the digitised file will need to be compatible with the product, otherwise it will need to be digitised again. Beanies and clothing can only have flat embroidery, and the clothing boundary is a square as opposed to the rectangles for hats. 3D embroidery uses a different digitised file than flat, so if you want to use the same design for both embroidery options you'll need to pay the digitising fee twice to have two files created. If you're in doubt, get in touch! We'll let you know if your design will be cross-compatible, or what you'll need to change for it to work on all products. How much does digitising cost? The cost is £10 plus VAT per design. Thread colours can be changed at no additional cost, and the same digitised file can be used as many times as needed.